WASHINGTON, D.C. – A new study released today by the Coalition for Affordable Prescription Drugs (CAPD), conducted by Oliver Wyman Actuarial Consulting, Inc. (Oliver Wyman), estimates Part D costs would be 58 percent higher absent pharmacy benefit managers’ (PBMs) evidence-based clinical programs and price negotiations with pharmacies and drug manufacturers. The study provides the most comprehensive look to date at the savings generated by PBMs in the Medicare Part D program. utilization and help patients improve their adherence to medications. According to the Centers for Medicare & Medicaid Services (CMS), more than 39 million seniors receive coverage for prescription drugs through the Medicare Part D program. 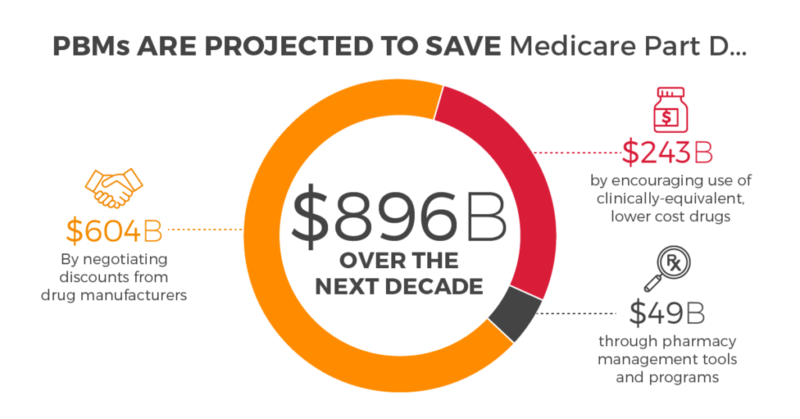 As of 2014, aggregate annual Part D costs reached $80.5 billion and are expected to reach $215.1 billion, as the number of seniors covered is anticipated to reach 55 million by 2025. This analysis details the significant role PBMs play in controlling costs in the Part D program and ensuring more affordable access for all beneficiaries. The study estimates that without PBMs, beneficiary premiums would be 66 percent higher. Because of PBMs, CMS and Part D beneficiaries combined will save on average $153.81 per enrollee, per month over the 2016-2025 period, which translates to more than $1,800 per enrollee, per year. “Our study analyzed CMS data from 2014 to determine what savings PBMs generated for CMS and Part D enrollees, through direct negotiation with manufacturers to drive down the list price of prescriptions, through encouraging the use of lower cost generics by formulary management, and through evidence-based benefit management programs,” said lead Oliver Wyman researcher Randall Fitzpatrick.